Aim: The aim of this study is to compare the results of nested polymerase chain reaction (PCR) for early detection of genital tuberculosis (GTB) using menstrual blood (MB) and endometrial tissue (ET) as samples in females presenting as infertility. Methods: The ET and MB samples were collected from a total of 194 females, enrolled in this study. DNA isolation from samples was done using standard, phenol–chloroform method. Heat shock protein gene (hsp65/groEL2) of Mycobacterium tuberculosis was targeted and amplified, and the final products were analyzed. Results: Overall, 126 (65%) cases of infertility were positive for M. tuberculosis complex by nested PCR. The detection rates in the two samples were statistically insignificant. The combined positivity rate of ET and MB, when compared with positivity rate in MB showed a positive predictive value, negative predictive value, and accuracy of 100%, 68.7%, and 84%, respectively. The results of nested PCR using MB as sample alone showed good agreement with the nested PCR results of the combined samples. Conclusions: The hsp65 Nested PCR of MB can be used as a noninvasive screening test for early diagnosis of GTB. Endometrial tissue (ET) sample obtained by curettage is considered to be the ideal sample in the diagnosis of endometrial tuberculosis (TB). However, this invasive procedure is contraindicated when associated conditions such as pelvic inflammatory disease, vaginismus, cervical stenosis, and coagulopathy are present as curettage may further lead to the flaring of the existing problem. There are a few studies available which have explored the utility of molecular methods in the diagnosis of female GTB on isolated samples either endometrial tissue (ET) or menstrual blood (MB). 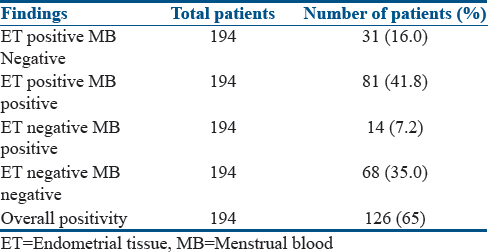 While a study from Ethiopia has included only biopsied ET, an Indian study has included MB specimens for the detection of MTB., However, they have not compared the utility of MB with endometrial biopsy in the diagnosis of GTB by using nested PCR. Hence, in the present study, the utility of MB specimens which may be collected repeatedly by noninvasive technique has been explored in comparison to ET in the diagnosis of female GTB. The present study is a cross-sectional study, carried out in Departments of Microbiology and Obstetrics and Gynaecology of Institute of Medical Sciences, BHU, Varanasi India. The total duration of the study was 3 years, from July 2013 to June 2016. Ethical approval was obtained from the Ethics Committee of the Institute of Medical Sciences, BHU, Varanasi India, and consent was obtained from each participant. A detailed history about age, parity, duration of infertility, years of living with the husband, sexual history, contraceptive used, pattern of menstrual cycle, regularity, interval, duration of flow, associated symptoms, other medical disorders, past medical/surgical history, and previous medication was obtained. General and gynecological examinations including pelvic examinations were performed. All the patients were subjected to routine investigations such as hemoglobin percentage, total leukocytes count, differential leukocytes count, erythrocyte sedimentation rate, chest X-ray, HIV I, II and abdomen and pelvic sonogram. The patients were identified as a case of GTB on the basis of morphological features observed at the time of laparoscopy. Features suggestive of TB such as frank tubercles, caseation, granuloma, and beaded tubes were looked for. The evidence of the past chronic infection in the form of thickened tubes, intraluminal caseation, and terminal hydrosalpinx with distorted tubes, tubo-ovarian masses, and flimsy adhesions in the pouch of Douglas was also accounted. The inclusion and exclusion criteria were adopted from Bhanothu et al. All patients met the inclusion criteria, i.e., 18–40 years of age with, pelvic pain, scanty menstruation with irregular periods, dysmenorrhea, oligomenorrhea, amenorrhea, general malaise, and menorrhagia leading to the abortions. Radiological findings may or may not be indicating TB. Laparoscopic findings including: (1) evocative diagnosis of TB (occurrence of caseation, granuloma/tubercles and/or beaded/thickened tubes); (2) possible diagnosis of TB (hydrosalpinx, peritubal/periovarian adhesions, and tubo-ovarian mass without frank tubercles/caseation); (3) incidental findings (pelvic pathology other than pelvic inflammatory disease including fibroid uterus, endometriosis, polycystic ovaries); and (4) normal findings. Histopathological findings indicating chronic inflammation or lesions such as proliferative solid epithelioid granulomas, dense polymorphonuclear cells, lymphocytic infiltrations, giant or beaded cells, enlarged lymphoid cells, and accumulation of plasma and spindle cells. The demonstration of tubercle bacilli in culture, Z–N staining of MB fluids, pelvic aspirated fluids, endometrial curetting, ET biopsies, and ovarian tissue biopsies were considered. Exclusion criteria were as follows: women above 40 years of age, symptoms suggestive of pulmonary TB/extrapulmonary TB except infertility, with normal abdominal and vaginal examinations, with pregnancy or nursing, severe psychiatric dysfunctions, endocrine problems, sexual disorders, multiple sclerosis or other autoimmune disorders, pulmonary infections, HIV co-infection, women with diabetes, malnutrition, and other medical disorders such as hypertension, peritoneal adhesions due to previous abdominal surgery, infertility due to male factors, and abnormality in ovulations. A total of 194 females were included in this study who fulfilled the inclusion criteria. ET was collected in normal saline 2–3 days before the anticipated day of next menstrual cycle, i.e., in the premenstrual phase of the same cycle. After taking informed consent and making sure that there had been no sexual exposure in that cycle, the ET biopsy samples were collected by curetting the endometrial cavity using the Novak's cannula with or without dilating the cervix under deep sedation or anesthesia. The patients were advised to attend the clinic on the 2nd day of the menstrual cycle for the collection of MB. Menstrual flow is usually adequate on the 2nd day of the menstrual cycle. Sampling was done by convenience sampling technique. MB sample was collected from the cervix by a syringe into sterile containers. Samples, hence collected were immediately sent to the microbiology laboratory for further investigation. The ET was finely chopped using a sterile scalpel and homogenized manually in TE buffer (TRIS – EDTA–10 mMTris-HCl, 1 mM disodium EDTA, pH 8.0) until the solution became turbid. This was centrifuged at 10,000 g for 10 min. The supernatant was discarded, and the pellet was processed for further studies. DNA isolation was done using standard, phenol–chloroform method Reid et al. Heat shock protein gene (hsp65/groEL2) of M. tuberculosis H37RV (Locus AL123456) was selected for the primer designing. This gene is conserved housekeeping gene the oligo sequences were selected in such a way to make it specific for MTC (M. tuberculosis, Mycobacterium bovis, Mycobacterium africanum and Mycobacterium microti). The outer primers were selected between the nucleotide sequence of 421891 bp and 42175 bp by using multiple sequence alignment. The nested primers were selected from the gene sequence extending from 421891 bp to 422090 bp as shown in [Table 1]. Taq polymerase enzymes and customized primers were procured from SBS Genetech Co., Ltd., China. PCR reaction was carried out in 25 μl volume. Reaction mix contained 10× reaction buffer (5 μl/sample), dNTPs (0.25 mM each), forward and reverse primers (10 pmole each) and Taq polymerase enzyme (1 unit/reaction) and 1.5 mM MgCl2. The template used was ranged between 50 ng and 100 ng of DNA from each of the patient sample. Amplification was carried out on BIO-RAD system with a heated lid. The hot start method was employed by heating at 94°C for 5 min initially. Thereafter, amplification was carried out for 35 cycles at 90°C for 1 min (denaturation), 65°C for 1 min (annealing), and 72°C for 1 min (extension). An extra extension was carried out at 72°C for 7 min. The amplification products of primary PCR was again amplified with nested primers following same the protocol. The final amplification products/bands were analyzed on 1.5% agarose gel stained with ethidium bromide under ultraviolet light [Figure 1]. Positive (DNA extracted from M. tuberculosis growth) and negative (double distilled water) controls were run with each batch of samples analyzed. The documentation of gel was done by Gel doc system BIO-RAD (USA). The reference strains M. tuberculosis ATCC H37Rvwas included to evaluate the specificity and sensitivity of nested PCR for hsp65 gene-specific primers of M. tuberculosis. Patients were considered to be positive for GTB when either alone results of nested PCR for ET or MB or in combination was found to be positive. The significance of MB as a diagnostic sample was evaluated against the ET sample for detection of GTB using bivariate two by two tables. Sensitivity, specificity, positive predictive values, negatives predictive values, and agreement by Cohen's Kappa test were calculated. The study population has a mean age of 22.75 years (range: 19–38 years). MTC specific primers targeting hsp65 gene could amplify the desired size of amplicon in 57.7% and 49.0% of ET and MB samples, respectively [Figure 1]. The detection rates in the two samples were statistically insignificant [57.7 vs. 49.0 P = 0.08; [Table 2]. The positivity when combined altogether, 65% of the patients were found to be positive for the diseases [Table 3]. While 81 (41.7%) of the patients yielded M. tuberculosis-specific amplicon in both the samples, 16% of the patients were exclusively positive in ET and 7.2% in MB. When we considered positivity rate of ET and MB in combination and compared with positivity rate in MB, we found the positive predictive value, negative predictive value and accuracy were 100%, 68.7%, and 84%, respectively. Similarly, the positive predictive value, negative predictive value, and accuracy were 100%, 83%, 93% when positivity of ET was compared with the above-mentioned gold standard (combined positivity). By Kappa statistics, the results of nested PCR using MB as sample alone showed good agreement with the nested PCR results of the combined samples (κ = 0.68). Female GTB of the endometrium is a well-recognized entity in the etiology of infertility, especially in TB endemic countries like India. The diagnosis is a challenge to the clinician as it is mostly either asymptomatic or presents with nonspecific symptoms in affected females. It could be observed through this study that 65% of the cases of infertility were due to the tuberculous involvement of endometrium. Schaefer and Onuigbo in their two different reports have shown an involvement of ET in 50%–60% of the cases., Infertility might, therefore, be occurring due to disturbed implantation of the developing embryo on the endometrium. The mean age of acquiring endometrial TB in our study was 22.75 years. This finding has good concordance with a report published earlier. The finding indicates that early reproductive age is the most vulnerable period to acquire GTB. This could be because of the fact that after puberty the blood supply to the pelvic organs is increased resulting in more bacilli reaching and seeded in the reproductive organs. Many researchers have studied this aspect of female GTB comparing different diagnostic tests on ET and MB samples. Correct diagnosis often relies on ET sample obtained by biopsy which is an invasive procedure. MB as a sample in the detection of endometrial TB has been used in many studies, but its utility over the endometrial sample in detecting infection is still a subject to explore. The traditional less sensitive, time-consuming, and labor-intensive methods, i.e., histopathological and mycobacteriological examinations (smear and culture) in the diagnosis of TB are now been overshadowed by more sensitive, rapid, and easier PCR-based methods. Researchers have recommended direct molecular detection of MTC be used as an adjunct to other methods of laboratory diagnosis of TB. The specificity (82.9%) and sensitivity (72.3%) of the detection of MTB from MB samples in our study are in good agreement with the overall specificity and sensitivity of the PCR technique as reported by Zamirian et al. Another study has reported the sensitivity range between 55% and 90% of the detection of MTB by PCR from clinical specimens. The limitations of the PCR techniques are the false-negative results (more common with MB samples in this study), which can be attributed to either paucibacillary nature, or inefficient extraction of the DNA from the sample. Thus, sampling plays an important role in the accuracy of detection of GTB. Since the involvement of the genital tract in TB could be generalized or patchy, and the technique of sample collection is blind, there is a possibility of missing the infected area when ET is collected. However, the overall positivity rate of MB can be increased by repeated sampling over a period of time. While multiple sampling for ET (invasive method) is not feasible, a noninvasive sample like MB which can be taken during different cycles and extracting DNA from a large volume of MB for PCR seems to be a better specimen in these circumstances. An added advantage of MB sample is that the MB can be collected undertaking sterile precautions by the patient itself from the periphery and can be sent to the laboratory for further workup. Our study is unique as we have assessed the utility of nested PCR on MB over ET samples collected from the same patient. None of the studies conducted so far have made a similar comparison to the best of our knowledge. Nested PCR using MB as a sample has an insignificant difference with that of ET in our study. Thus, MB seems to have a practical utility in being a noninvasive test and could be used as a preliminary screening test for diagnosis of GTB. On the contrary, Patil et al. in their study did not find MB to be a potential alternative clinical sample in the diagnosis of endometrial TB. They had MB as well as endometrial aspirates tested by a commercial kit GEN-PROBE AMPLIFIED M. tuberculosis direct test which is a nucleic acid amplification test. The disparity in the results might be because of low sample size, volume, and difference in the platform of the testing or the poor selection of the cases in their study. Moreover, the authors did not perform various investigations particularly PCR of ET and MB, and acid-fast bacilli culture for every woman. Was their kit base method comparable in sensitivity with nested PCR as done in our study, is not known. For these reasons, the comparison made by them between the two samples should be interpreted with caution. Since the detection rates in the two samples studied were statistically insignificant, therefore the nested PCR of MB seems to be a good option for diagnosis of GTB. The hsp65 nested PCR of MB can thus be used as a noninvasive screening test for rapid detection GTB. However, further study is needed involving more cases with multiple samples for the validation of the observation made in this preliminary study. The author would like to acknowledge the technical staff of the Department of Microbiology, Department of Obstetrics and Gynaecology, IMS BHU Varanasi, for their sincere support to carry out this study. The authors express their heartiest thanks to Prof. T. B. Singh, Department of community medicine, IMS, BHU, Varanasi, for giving precious time for statistical analysis. Namavar Jahromi B, Parsanezhad ME, Ghane-Shirazi R. Female genital tuberculosis and infertility. Int J Gynaecol Obstet 2001;75:269-72. Grace GA, Devaleenal DB, Natrajan M. Genital tuberculosis in females. Indian J Med Res 2017;145:425-36. Ghosh K, Ghosh K, Chowdhury JR. Tuberculosis and female reproductive health. J Postgrad Med 2011;57:307-13. 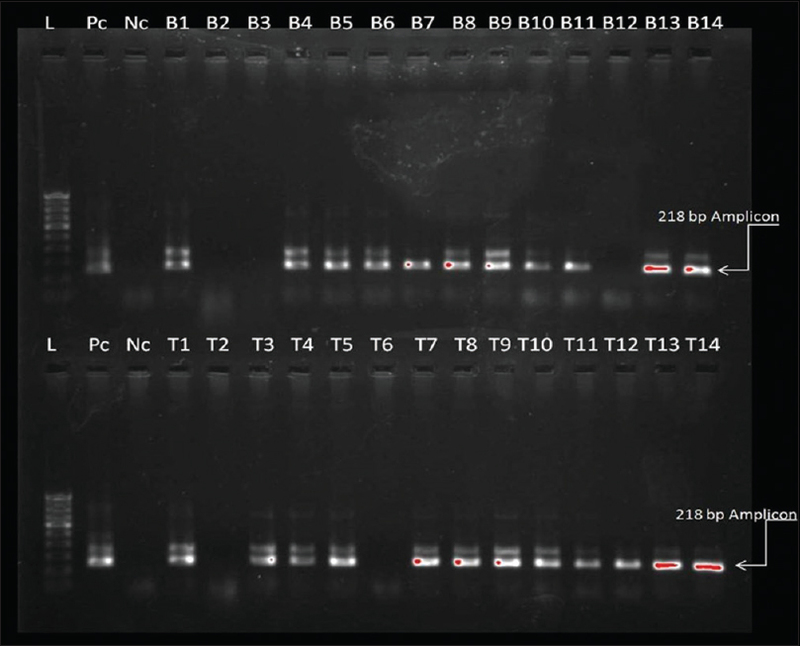 Rivasi F, Curatola C, Garagnani L, Negri G. Detection of Mycobacterium tuberculosis DNA by polymerase chain reaction from paraffin samples of chronic granulomatous endometritis. Histopathology 2007;51:574-8. Singh S, Gopinath K, Shahdad S, Kaur M, Singh B, Sharma P, et al. Nontuberculous mycobacterial infections in Indian AIDS patients detected by a novel set of ESAT-6 polymerase chain reaction primers. Jpn J Infect Dis 2007;60:14-8. Cheng VC, Yew WW, Yuen KY. Molecular diagnostics in tuberculosis. Eur J Clin Microbiol Infect Dis 2005;24:711-20. Rahaman HS, Kumar G, Meena VK, Agarwal A, Nath G, Kumar K. Comparative Evaluation of BacT/ALERT 3D Culture Medium and Nested PCR in the Diagnosis of Tuberculous Meningitis. SAARC Journal of Tuberculosis, Lung Diseases and HIV/AIDS 2015;11:15-20. Zakham F, Bazoui H, Akrim M, Lemrabet S, Lahlou O, Elmzibri M, et al. Evaluation of conventional molecular diagnosis of Mycobacterium tuberculosis in clinical specimens from Morocco. J Infect Dev Ctries 2012;6:40-5. Abebe M, Lakew M, Kidane D, Lakew Z, Kiros K, Harboe M, et al. Female genital tuberculosis in Ethiopia. Int J Gynaecol Obstet 2004;84:241-6. Patil AD, Shinde SK, Sachdeva GM, Pasi AR, Chitlange SM, Chandhiok N, et al. Is testing of menstrual blood justifiable for diagnosis of endometrial tuberculosis among infertile women?. Indian Journal of Obstetrics and Gynecology Research 2015;2:103-7. Bhanothu V, Theophilus JP, Rozati R. Use of endo-ovarian tissue biopsy and pelvic aspirated fluid for the diagnosis of female genital tuberculosis by conventional versus molecular methods. PLoS One 2014;9:e98005. Sambrook J, Edward FF, Maniatis T. Molecular cloning: A laboratory manual. 2nd ed. Cold Spring Harbor Laboratory Press; 1989. Onuigbo WI. Genital tuberculosis and reproductive function. J Reprod Med 1978;21:249-50. Crofton J, Horne N, Miller F. Clinical Tuberculosis. 1st ed. London: Macmillan Education Ltd.; 1992. p. 502-10. Kashyap B, Kaur T, Jhamb R, Kaur IR. Evaluating the utility of menstrual blood versus endometrial biopsy as a clinical sample in the diagnosis of female genital tuberculosis. Asian J Med Res 2012;1:45-9. Alli OA, Ogbolu OD, Alaka OO. Direct molecular detection of Mycobacterium tuberculosis complex from clissnical samples – An adjunct to cultural method of laboratory diagnosis of tuberculosis. N Am J Med Sci 2011;3:281-8. Carroll K, Hobden J, Miller S, Morse S, Mietzner T, Detrick B, et al. Jawetz, Melnick, & Adelbergs Medical Microbiology. 21st ed. Shenzen, China: McGraw-Hill; 2016.